VIA is focused on the future with Vision 2040, an update to the Long Range Comprehensive Transportation Plan (LRCTP). VIA’s SmartMove five-year capital improvement plan is about taking action now, with near-term solutions that help improve the VIA system today. VIA is conducting a Comprehensive Operations Analysis (COA) to review existing services and evaluate how these services are functioning in the region. The COA includes a route-by-route study of existing VIA services that explores opportunities to increase ridership, and enhance service efficiency and cost effectiveness. The COA also examines the role of other mobility options and the feasibility of integrating them into the greater service network. The COA will help develop a plan for enhancements to public transportation and mobility in our region. VIA updates its Long Range Plan every five years with revisions and amendments. This periodic update allows VIA to prioritize and align transit investments to coincide with other regional projects and priorities. Vision 2040 is an update to VIA’s Long Range Comprehensive Transportation Plan, which identifies priorities for the public transportation system serving San Antonio and surrounding communities. The Vision 2040 planning effort will investigate the impact of growth in our region and engage our community in a conversation about how transit can play an increased role in supporting our region’s transportation system. Vision 2040 builds upon the SmartMove capital improvements and identifies priorities that will move our region forward. The greater San Antonio region is growing and will face significant travel challenges in the future. Part of VIA’s Vision 2040 long-range plan has been to identify a system of Rapid Transit Corridors as areas of opportunity where transit can play an increased role in supporting our transportation system. Learn more about VIA’s Rapid Transit, to stay up to date and involved in the process. SmartMove 5-year Capital Improvement Plan includes transit centers, a Park & Ride facility, and improved customer amenities. SmartMove is part of VIA’s Long Range Plan. The collaborative vision, with input from city leaders, local and national transportation experts, and the community, addresses the tomorrow’s transportation needs today. VIA’s newest Park & Ride location serves the fast-growing U.S. Highway 281-Loop 1604 area. The new transit facility, located on the southwest corner of U.S. Highway 281 and Stone Oak Parkway, initially serves two new bus routes: Route 7 Express to downtown and Route 503 service to the South Texas Medical Center. The state-of-the-art facility features a four-deck garage with 400 parking spaces and elevator access, an indoor waiting area for passengers, access to free 4G LTE Wi-Fi, and a staffed full-service information center to assist VIA customers with tickets sales, bus route information and other services. VIA Park & Ride and Vanpool riders can also utilize the free parking spaces at the facility. The newest Park & Ride facility will eventually have direct access lanes connecting the upper level of the garage to future U.S. Highway 281 managed lanes being developed by the Texas Department of Transportation, which is currently working to expand U.S. Highway 281 North from Loop 1604 to Stone Oak Parkway. VIA Brooks Transit Center, opening in 2019, will feature convenient, high-frequency bus service and modern passenger amenities like vehicle charging stations, interior seating, phone charging ports, and public art by San Antonio artist Diana Kersey. The landscape includes Native Texas flowering plants that will complement the vibrant and sustainable Brooks community. Solar panels and environmentally friendly landscaping techniques highlight VIA’s commitment to sustainable growth. The new transit center will feature 50 parking spots, a full customer information center, next-bus arrival information, free 4G LTE Wi-Fi, ticket vending machine, an air-conditioned waiting space, restrooms, and bicycle racks. Centro Plaza at VIA Villa (formerly called the Westside Multimodal Transit Center) is a state-of-the-art transit hub on the near-West Side of San Antonio. The Plaza opened in December 2015 and serves 1 million passenger trips each year, while it improves accessibility to the city’s Central Business District, UTSA Downtown Campus, and University Health System’s Robert B. Green Campus. The modern Plaza facilitates route transfers, helps alleviate congestion in the Downtown area, and encourages new mixed-use development opportunities. The site features convenient passenger amenities, including an enclosed waiting area, full-service customer information center, plaza-style seating, and well-lit stop and shelter areas. It utilizes solar energy and features other environmentally friendly features, including a water-capture system beneath its stone pavers. Centro Plaza’s signature feature, Centro Chroma Tower by San Antonio artist Bill Fitzgibbons, was dedicated in April 2016 and stands as a new Downtown landmark and a beacon for travelers. Improvements underway for VIA’s S.W. Military Primo route will connect the Kel-Lac Transit Center with the planned Brooks Transit Center. The Military Primo project consists of new Primo bus service along S.E. and S.W. Military Highway from South New Braunfels Avenue to U.S. Highway 90 West. The work is part of VIA’s South/West Corridor Transit Improvements Project to expand Primo Service along Zarzamora and Military Primo corridors and will allow VIA to provide faster, more reliable service. Plans call for construction of 20 new stops along the route that will feature Next-Gen lighted shelters with seating; free 4G LTE WiFi service, a digital screen with next bus arrival information, and a security camera system. The project includes various sidewalk improvements to provide safe and convenient pedestrian crossings along the corridor. Work will begin in late 2017 and take approximately 13 months to complete. VIA has added 1,000 sheltered bus stops to provide customers a comfortable and weather-protected waiting area. VIA provides bus service for more than 40 million trips each year within a 1,226-square-mile service area. In October, VIA installed more than 300 shelters. A program goal of 1,000 new shelters citywide was set in mid-2014. Another 150 sites are under construction and more are in production. Streamlined and modern, the new bus shelters provide comfortable, covered seating, additional lighting, and route information displays with real-time bus arrivals to make travel safer and easier to make your next connection. Flexible modular concepts will serve differing capacity needs tailored to each bus stop and are designed to respect the historic or cultural fabric of area parks, neighborhoods, places of interest and historic sites. VIA is working to make your travel experience the best it can be. As we make additional progress, we will continue to bring you news about this and other SmartMove projects. VIA is in the process of issuing an RFP (Request for Proposal) for Joint Development to respond to improvements to accommodate both the additional daily transit operational needs, and an augmented program to provide for commercial/residential development options. This effort will help ensure ridership growth potential, and move the agency closer to the goal of providing more sustainable options in more sustainable communities. VIA recognizes its role as a steward of the environment and is committed to the reduction of vehicle emissions in the region. The use of alternative fuels solidifies the company’s commitment to reducing pollution by meeting or exceeding the latest standards from the Environmental Protection Agency. With some recent actions, VIA has moved into new territory with innovative revenue vehicles that run on alternative power sources. In 2016, VIA began its multi-year plan to purchase clean-energy vehicles, fueled by compressed natural gas (CNG) to replace aging buses in its fleet. The vehicles scheduled for replacement are at least 15 years old. The agency’s fleet expansion will reduce operating costs and allow the agency to carry out planned service enhancements. VIA introduced the first of its buses to run on CNG in 2010 with funding from the American Recovery and Reinvestment Act of 2009, or ARRA. In 2017, VIA announced the sale of $82 million in MTA Contractual Obligation Bonds to help finance the purchase of 270 CNG-fueled buses as part of the agency’s SmartMove five-year capital plan. VIA plans to complete the CNG fleet conversion by 2020. VIA’s agreement with CPS Energy made it the first public agency in San Antonio to receive 100 percent of its power from Windtricity, removing approximately 7,180 metric tons of carbon dioxide from the atmosphere. In 2013, VIA introduced the Arc, all-electric buses for regular service in the Downtown area. Arc service was made possible by a grant from the Transit Investments for Greenhouse Gas and Energy Reduction program as part of the American Recovery and Reinvestment Act of 2009. This funding was made available to encourage the use of cutting-edge environmental technologies, and a total of $100 million was awarded in a nationwide competition. VIA is one of just 43 transit agencies from across the nation that received this funding, and it is also the only transit agency in Texas that was awarded in this process. VIA also acquired 30 new diesel-electric hybrid buses built by New Flyer. These buses are in service along VIA’s express routes to help daily commuters reduce the city’s overall fuel consumption while cutting back on emissions. The hybrid buses are equipped with extra amenities such as reclining seats, overhead storage, and individual lighting. VIA is committed to becoming an environmental leader in the industry and pledges to provide necessary education and tools to all persons working for or on behalf of VIA to successfully carry out this program. VIA promotes implementation of goals and programs that will continually reduce our environmental impact on the community and environment. In January 2016, VIA Metropolitan Transit’s Environmental and Sustainability Management System (ESMS) earned an ISO 14001:2004 certification from the International Standards Organization (ISO) for its proactive sustainable efforts controlled through its ESMS. VIA Metropolitan Transit’s ESMS provides a strategic and systematic approach to the management of environmental impacts. Implementation of an ESMS maximizes organizational benefit through risk mitigation, prevention of pollution, and regulatory compliance, and will help VIA to provide the community with safe, reliable and sustainable transportation. Each of VIA’s employees is entrusted with incorporating the actions necessary in their work to fulfill this commitment. This Environmental and Sustainability Management System Policy will be documented, regularly reviewed, communicated to all persons working for or on behalf of VIA, and be made available to the public. Call (210) 362-2460 for more information. VIA’s services also can be accessed through several third-party apps that provide easy-to-use trip planning and schedule data. Read more about planning with apps that stream real-time transit information for the San Antonio area. 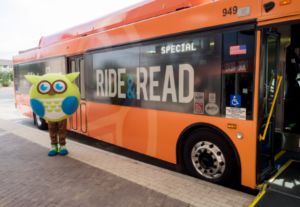 BiblioTech and VIA Metropolitan Transit have partnered to bring Bexar County’s all-digital public library to the traveling public with the “Ride & Read” program. This partnership brings VIA on board with BiblioTech’s mission to enhance education and literacy, promote reading as recreation, and equip residents with necessary tools to thrive in our modern landscape. Kiosks and ADA-accessible wall-mounted screens will be installed at VIA transit and information centers throughout the service area. It’s free and easy to sign up. Learn more about how to Ride & Read. VIA offers free 4G LTE WiFi service on every bus and van, and at every transit facility. It was the first major transit agency in the nation to offer the free, high-speed service as part of its commitment to integrate technology in modern passenger amenities. Riders can work, study, stay connected, and surf the Internet while we drive.